Other cultures can really be fascinating for someone who isn’t used to their way of life. Some of us are even willing to go as far as paying an exorbitant amount of money for things we’ve never seen that come from other countries, specifically based around the reason they’re from another country. More often than not, Asia is the country that experiences this phenomenon the most. Countries like Korea, Japan, and China end up attracting a huge amount of fascination, not just of all of the interesting things they make, but because they often make more interesting things than most. When we talk about all of Asia’s contributions to the world, there’s definitely a lot to cover. We actually use a lot of things that come from Asia today. However, there are some things that either come from Asia, or are made in Asia, that have only really come into prominence there. Some of stuff they create may just be a little too weird for the rest of the world and that’s why we haven’t caught on. But we will let you be the judge of that, you might even see yourself using something Asia has created on this list. You just never know! Here are 15 gross and disturbing things you can only find in Asia! Which one grosses you out the most? Let us know! If you ever found yourself looking for a way to clean your house and watch your baby at the same time, this may actually be the way to do it. Basically, you put your baby in this mop, and while your baby is crawling, their also cleaning your house for you at the same time. When we say “in the mop,” we mean it too, because the baby mop is not just a mop, it’s a onesie that has mop-like attachments on the legs and arms of the onesie. 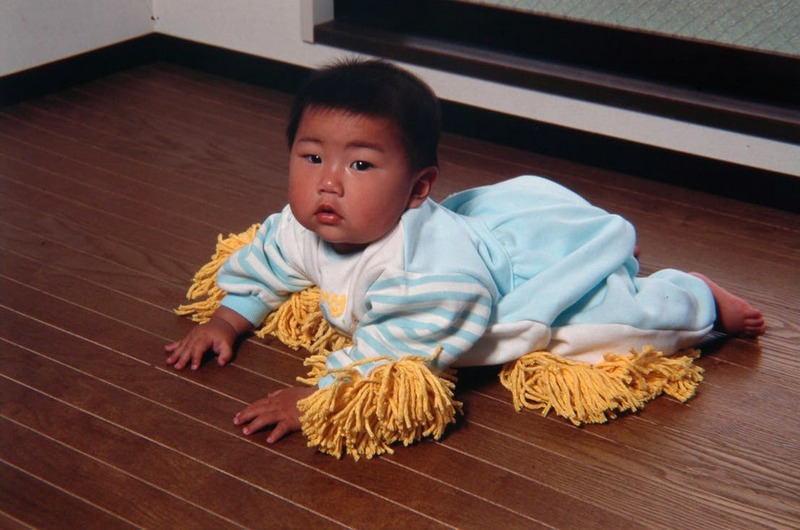 You may find this rather strange, but in Asia, using your crawling baby to clean your house is actually rather common here.